I've pretty much always had a microwave since I left college and began living on my own. But frankly, I was surprised when Que Tal had one aboard when we bought her. I'd never really thought of having one on a boat. 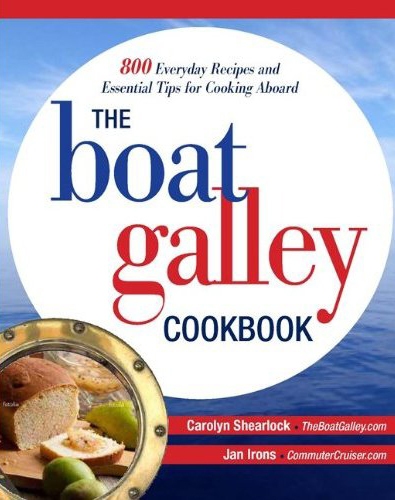 The Boat Galley: A Microwave on the Boat? First, there isn't one "typical" boater - some are living aboard and prepping a boat to go on an extended cruise, some are full-time cruising, some are weekenders, and all sorts of others. • Whether you have the power for it. Space is probably the simplest consideration and is simply a matter of whether you're willing to give up space for something else (equipment or just storage) in order to have the microwave. You'll have to make sure that you can get power to the intended location and engineer a tie-down system to make sure that the microwave won't go flying in rough conditions. Your microwave usage ashore may or may not be a good indicator of how much you'll use it on the boat. If you're working (or working on the boat as opposed to cruising) and the boat is at the dock, you may find that your lifestyle is very similar on the boat to ashore and your usage is about the same - heating up meals, cooking bacon and baked potatoes, melting butter, boiling water and so on. • Unless you have a large freezer, you're not likely to have a lot of frozen meals to just heat in the microwave (few anchorages have a store where you can just pick up something to heat up). • Water actually boils faster in a teakettle on the stove, and if you're on passage or in a rolly anchorage, it's safer as it's less likely to splash on you than in an open container in the microwave. • It's also a lot safer to melt butter on a gimballed stove than to risk hot oil sloshing in the microwave. • In rough conditions, many cruisers love being able to "bake" potatoes in the microwave - it's easy, you can often use the microwave when it's too rough for the stove, and potatoes are good even if you're mildly seasick. • It's also somewhat safer to cook bacon in the microwave than on the stove, particularly if it's rolly. Just be sure to use enough paper towels to absorb the hot grease so it won't slosh and burn you when you remove the dish from the microwave. • If you like popcorn (and it's a great snack), making it in the microwave is much easier than on the stove. And at least the microwave can be used for other things, where an air popper can't. Popcorn was BY FAR our biggest use! Many people find that they use their microwave as a bread box away from the dock. It's also a good place to put small electronics during a thunderstorm (read more about this at TheBoatGalley.com). Yeah, this is the big one. On shore power, no problem as long as the boat is wired with outlets where you need them. At anchor, it means a generator or an inverter and sufficient battery and charging capacity. A typical microwave is 1200 watts. With these, you're going to need at least a 2000 watt generator or a 1500 watt inverter (due to start up loads). With a 700 watt microwave, you may be able to get by with a 1000-watt generator or invertor. If you're going to use generator power, keep in mind that you'll have to run the generator every time you want to use the microwave. Most people find it impractical and end up either not using the microwave at anchor or deciding to run it off the inverter. If you're thinking about this, you might want to read Inverters 101 and Running a Microwave on an Inverter. So how much battery power will it take to run the microwave? I'll use a 1200 watt microwave as the example - the total power used by a 700-watt one is about the same as cooking/heating/thawing times are correspondingly longer. Ignoring any losses in the system (there are always inefficiencies but battery voltage is usually over a true 12 volts, so this works for estimation purposes), a 1200 watt microwave is going to use 100 amps at 12 volts. That's 100 amp-hours for a full hour of use... but we just want to know how much it uses per minute since that's how we use it. Dividing 100 amp-hours by 60 to get the amp-hours per minute, gives us 1.67 amp-hours per minute of microwave use. Ten minutes is nearly 17 amp-hours. From there, you can figure about how much you think you'd use it per day and design your power system accordingly... or decide that you don't want it... or that you'll only use it when you have shore power. The space/usage/power analysis is different for everyone. I know some cruisers who couldn't imagine not having a microwave and others who gave theirs away after realizing that they didn't use it enough to justify the space.